Let's talk about highlighters! 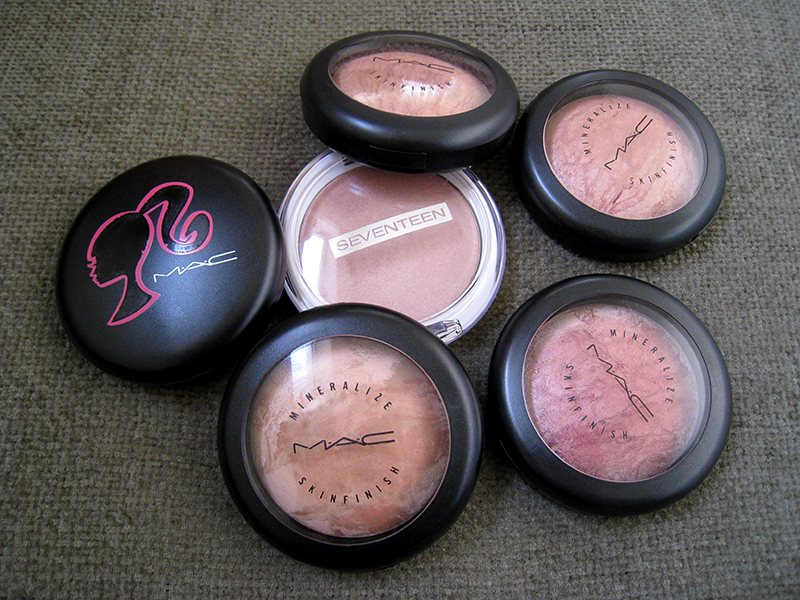 As you can see my humble collection includes mostly Mac, and that's because when I was younger I liked to collect highlighters from their limited edition collections, even though I almost never use them, yeah I'm that crazy! I also have a mini Benefit Highbeam, but since it's a liquid highlighter I didn't want to include it in this post, I wanted it to be more of my powder highlighter collection. A highlighter is the best product to use when you want a dewy look but not all over your face just only on some parts of your face, you can easily wear a matte foundation and still look fresh and dewy! 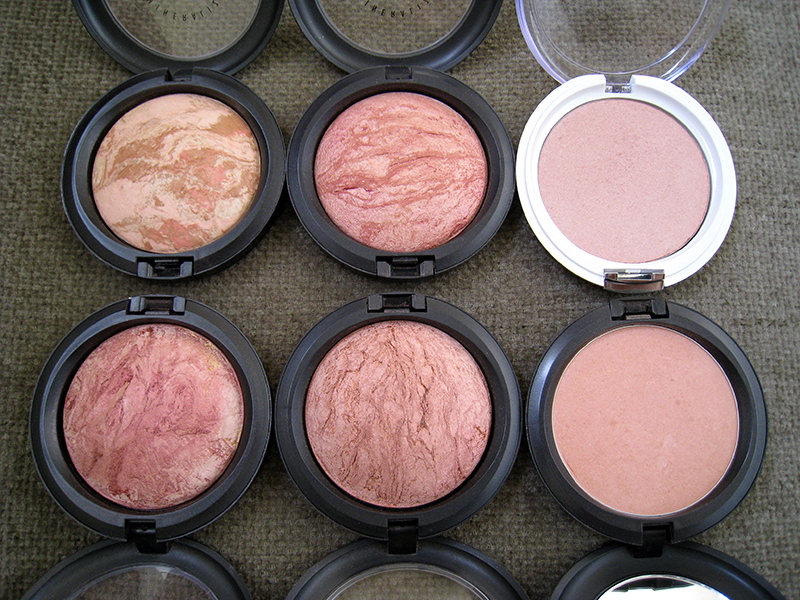 I like to use powder highlighters just because I have oily skin and they work better with oily skintypes, but you can also use a cream or a liquid one. Where I can highlight? Cheekbones, browbones and under the bridge of the nose. When you highlight your cheekbones just be sure that you highlight the highest part of the cheekbones and not the apple of your cheeks, so when you look your face in the mirror the highlighter is visible only when you turn your head to the side. A simple trick to find the highest part of your cheekbones, and something I personally like to do all the time, is just take the handle of your brush, put it by the side of your nose and take it to the top part of your ear, then you will be able to feel the bone with your fingers. You can do a small C shape with your highlighter between your cheekbone and the end of your eyebrow. Personally I like to highlight only my cheekbones just because I think that my nose does not need to be highlighted, that's the problem when you have a big and narrow nose. 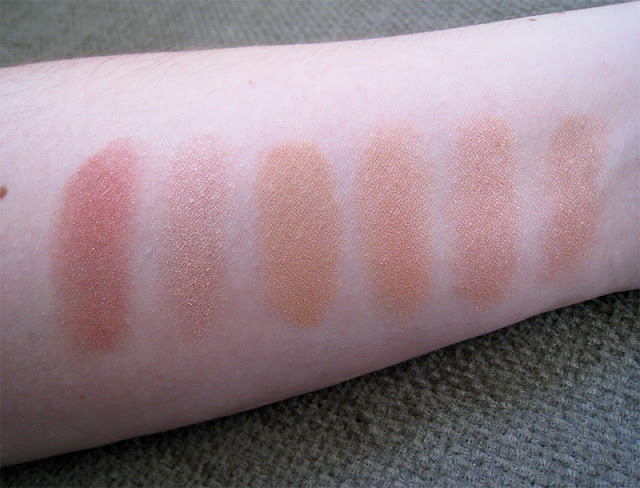 As for my browbones, I prefer to use matte eyeshadows. So let's see what's in my collection! 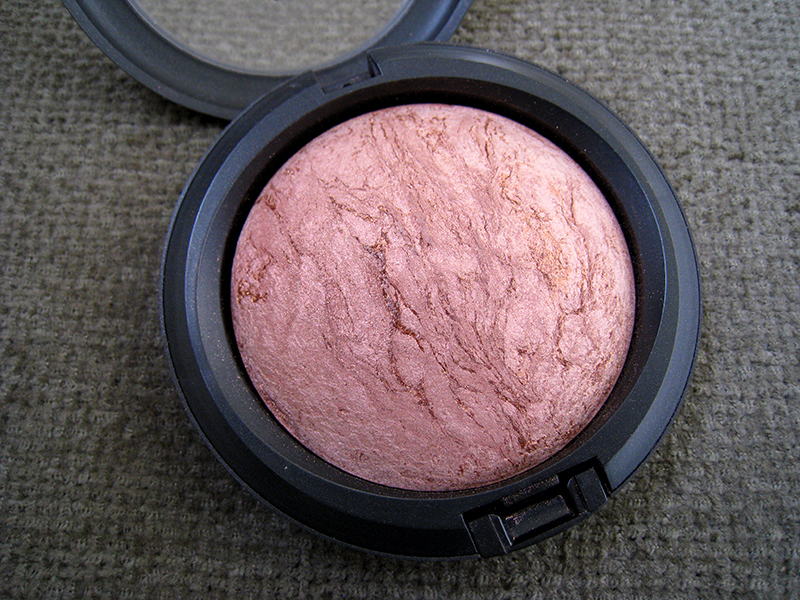 My most favorite highlighter from all the the ones that I own, and one of the few Mineralized Skinfinishes that Mac released which is soft and without any glitters, just fine shimmers! But what I love the most about Refined is the shade, it's a light apricot peachy shade that compliments any warm skintone, and looks amazing with peachy blushes. It was released with the Sugarsweet collection in Spring 2009. If only Mac had this in their regular line! Before I bought Refined, this one was my most used MSF, it was released with Mac's Danse collection in 2006. Glissade is a rosy-peach shade with a very smooth texture but you can barely see it, it adds no color on the cheeks, it just highlights. It contains rose-gold shimmers and fine microglitters, but they're subtle enough to wear on daylight. 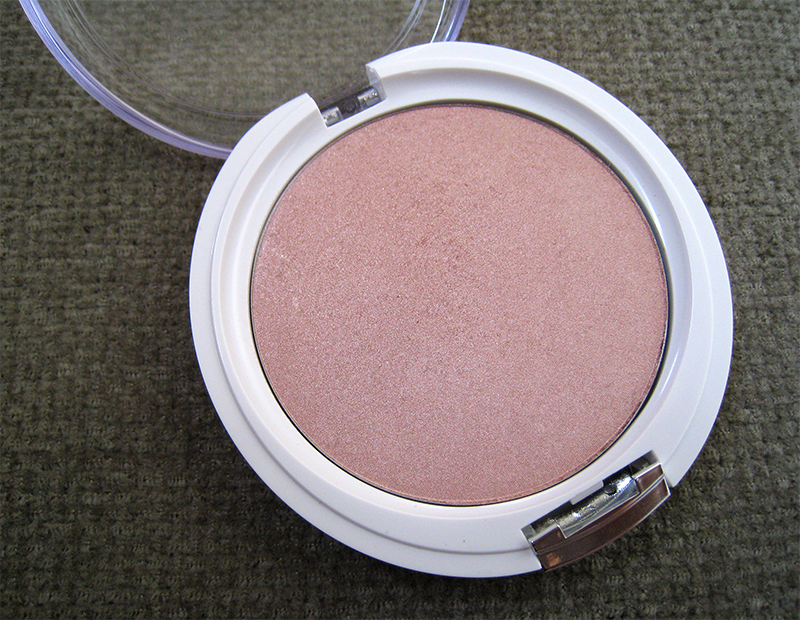 This is the latest addition to my highlighter collection, I actually won it at the Beauty Bloggers event in December. This is a great drugstore highlighter, it's not very cheap but also not as expensive as Mac MSFs are, plus it's not limited edition. 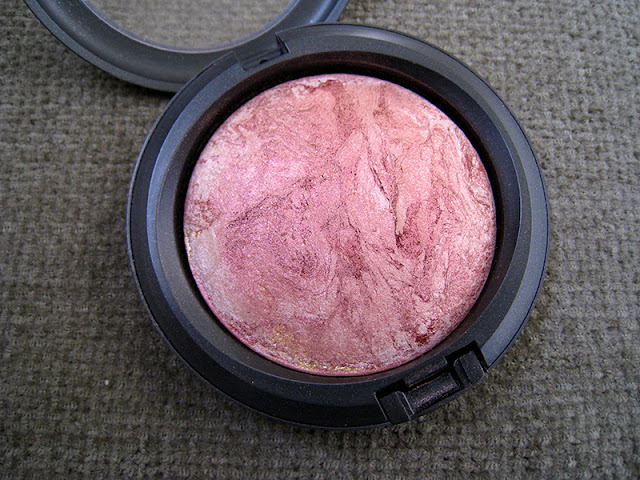 It's a rose pink highlighter with silver shimmers, no glitters at all., and works really well with pink blushes. 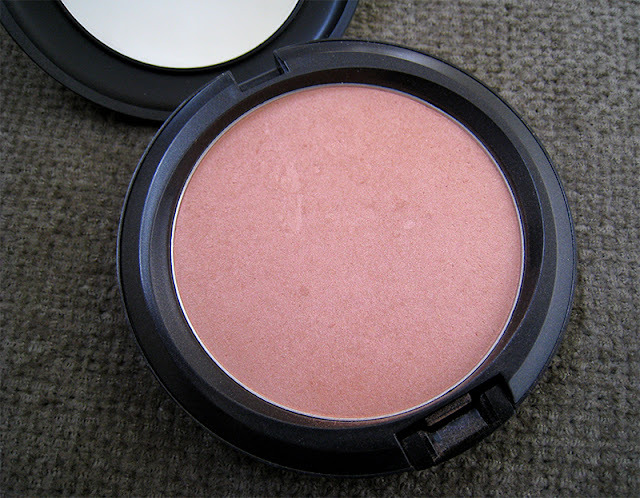 The texture is not super smooth, and if you spoiled yourself with a Mac Mineralized Skinfinish it's hard not to compare these two textures, but nevertheless it's an excellent powder highlighter! This is the oldest MSF I own, it was released with the Lingerie collection back in December of 2005, yep it's that old! It's actually the original version of Petticoat, because Mac re-released it a few years after that. I remember I was so obsessed with this one, I was going to every single Mac counter to buy it and it was sold out everywhere, and then I finally swapped for it. Propably it was all for nothing because honestly I haven't used it that much since then! 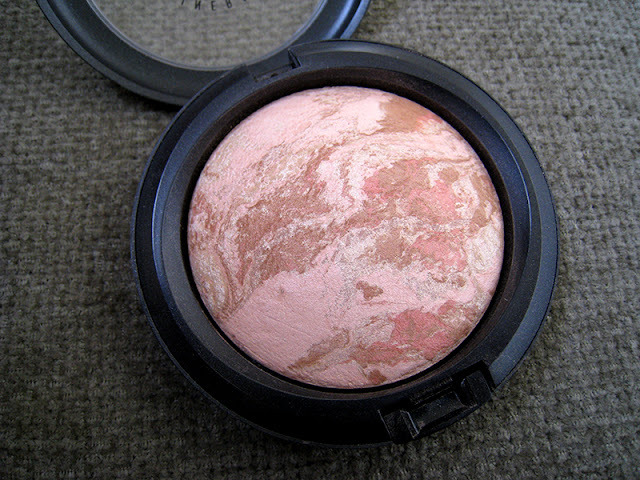 It looks so beautiful in the pan, it's a plum-rose shade with gorgeous deep plum and golden veining, but on the cheeks it's very metallic .It is also very pigmented and that makes it hard blending it with other shades of blush besides the same one, and I never use plum or rose blushes. 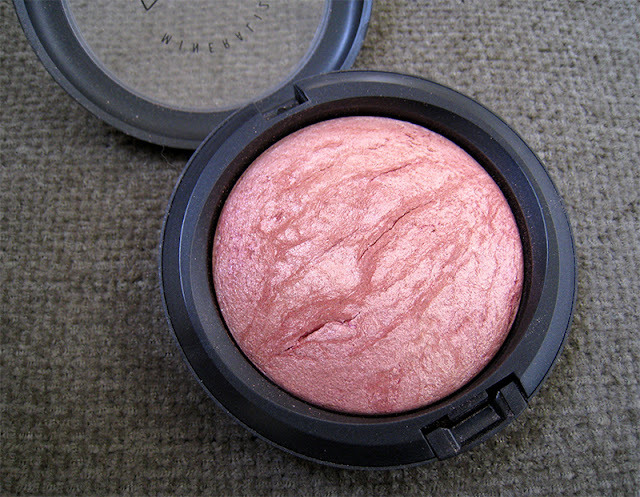 I have to say that Light Flush is my least favorite and barely used highlighter I own. It was released with the N collection in the winter of 2008, and I had really high expectations for this one because of all the reviews I've read back then. It was supposed to be a warm peachy pink shade, a more pigmented version of Glissade, but the reality is that it's an unpigmented muted rose shade with golden shimmers, and the texture is not soft at all. I don't know what happened, I may got a bad one, but this one was a big dissapointment. Along with Refined MSF, Pearl Sunshine is my HG highlighter, I can't choose between these two because I love them both so much! Pearl Sunshine is a soft peach, beige-peach shade I should say, with pink pearlised pigments. Its texture is totally different from the MSFs, it reminds me of Mac's pigments, very lightweight, and it's amazing on the browbone also. This is the best highlighter to compliment warm toned blushes, it gives that Jennifer Lopez glow on my cheekbones, and it's the only highlighter I use at summertime. I hope you liked my post! I want you to let me know what are your HG highlighters, and if you have any of the ones above, do you like them? Yeah they look like that on my pale hand but on my face the majority of them are just highlighters, warm highlighters though. ola fainontai teleia! !idiaitera to petticoat!! να σου πω την αληθεια εχω δει το Mary loy της Balm και εχω παθει πλακα..... περιμενα παντως να δω το soft & gentle στην συλλογη σου! Σταμάτησα να παίρνω MSFs το 2009, το Soft n Gentle βγηκε πιο μετα το ειδα καποια στιγμη στο μαγαζι αλλα μου φανηκε πολυ γκλιτερατο. δωσε μου κι εμενα κανενα μακ! υπεροχη η συλλογη σου!σαν ρουζ να τα φορας,κριμα ειναι να καθονται στο συρταρι. Δεν ειναι πολυ εντονα για να χρησιμοποιηθουν ως ρουζ, ειναι διαφανα κ εχουν πολλα shimmers. πραγματικα ειναι ολα τελεια!μακαρι να ειχα παρει κι εγω κανενα απο τα πιο παλια,τα αγαπω τα msf μου! Awww thank you! :) You should try one sometime, they're mostly limited edition, so if you have the opportunity in the future, grab one! They look so beautiful! I've never really tried a poweder highlighter but they look so pretty!